There’s been a lot of advancement in technology over the last several years and while most of it is great, some of it is not so great. One of those not so great things you now have to worry about is people stealing your credit card information without ever even seeing your card. RFID blocking wallets can help with that because they keep the scanners from being able to read your card through your wallet. Keeping yourself protected is crucial, and with these options, you’ll be able to do it a lot easier. Material: What is the wallet itself made out of? Is it made with leather? A faux leather? Something else? This is partially about personal preference but some materials are going to be thicker, giving an extra layer. 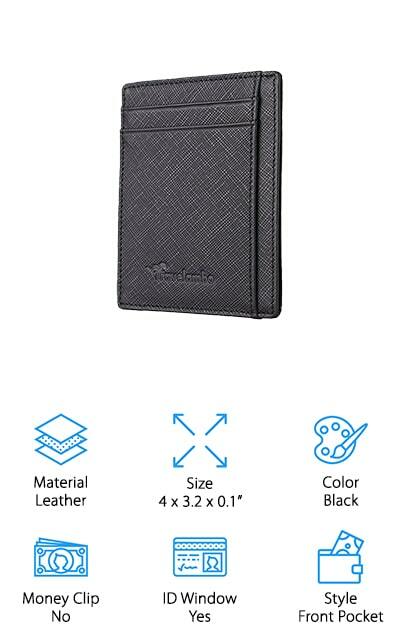 Size: How large is the wallet? You want something you’re going to be comfortable carrying around. If it’s too big it’s not going to fit in your pocket or bag easily and you may not use it the way that you should. Color: What color is the wallet? This is about your own personal preference but it’s something that may be important to you. After all, you want everything that you own to reflect your personal style and interests, right? Money Clip: Does it have a money clip to make sure your cash is separate? This is a personal preference but it can also be extremely convenient for you to have your money stored separately so it’s easier to get to. ID Window: Is there a clear pane that lets someone see your ID through the wallet without you having to take it out? This can be a big help if you buy things on credit frequently and need to be able to show your ID. 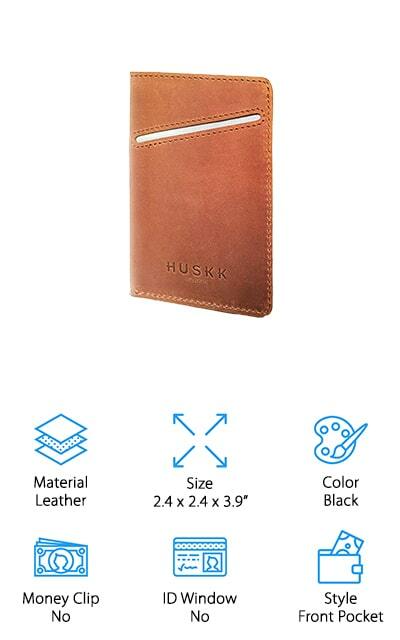 Style: What type of wallet is it? Is it a bifold, a slim option, trifold or something else? The style of the wallet that you prefer is another aspect that’s all about you. You want something you’re comfortable using. There are more wallets out there than you could probably imagine, but not all of them are designed to block RFID. That means you need to do a little more digging to find the right option, or you need to take a look at these. Each of these wallets that we’ve found has some great features and will help you stay protected. Make sure you’re looking at each one to see which will work best for you. After all, each one is going to be a little bit different. If you want the best RFID slim wallet, you’re going to want our top pick. This genuine leather wallet comes in a range of different colors to match your personal preference. Not only that but it has a 1-year warranty so you know that it’s going to last and give you the great quality you’re looking for. Designed to fit directly in your front pocket, this wallet features a money clip, a bifold design and the RFID blocking technology that you’re looking for. You’ll be able to easily access everything you need throughout the day and you can feel confident about giving it a try as well. You get a money back guarantee that lets you know you can get a full refund or replacement if you decide you don’t like it. The ID window makes it easy to show your ID when needed while the additional pockets keep your cards organized the way you want. When it comes to a great quality wallet you still don’t want to spend a lot of money and that’s where our budget pick comes in. With this wallet, you’re getting a front pocket design that holds everything you need in a simple way. You get several different pockets for credit cards as well as a money slot to carry your cash. On top of that, you’re still getting the ID window that lets you show your ID whenever you need to a whole lot easier. Made with genuine leather, this RFID blocking wallet helps protect you and everything you own. There’s a 1-year warranty included with the wallet that lets you know you can count on it to work and to last with daily use. Not only that but you can hold up to 10 cards in the slots and still have space for cash alongside it. 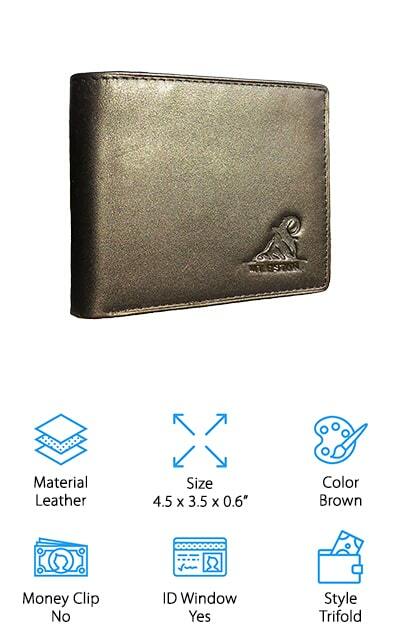 Here we have one of our best RFID men’s wallet options, which gives you a high quality, leather construction for the best possible durability. On top of that, you get space for 11 different cards, 4 extra items, plenty of bills and an ID card. The ID card window also gives you easy access to your identification. The trifold design makes it easy to slip into your pocket however you like and the pockets give you a firm hold for all of your items. What’s really great is you get the whole thing in a gift box that gives you options for that special someone. Designed to protect you from those who definitely don’t have your best interests at heart, this wallet has been approved for 10 MHz all the way up to 3000 MHz, so you’re always going to be protected when it comes to your credit cards. You want the best men’s RFID wallet and this is definitely one you’ll want to take a closer look at. It offers a slim design that fits easily into your front pocket but still provides plenty of space as well. In fact, you’ll have 6 card slots as well as an ID window and you’ll still have a separate slot for your cash as well. Designed to block anyone walking by from reading the information on your cards, it’s not actually designed to protect ID badges or hotel room keys. It comes in a range of different colors so you can pick out something that matches your personal preference and style. Made of genuine leather, this wallet starts out a little stiff and then softens slowly as you continue to use it. This ensures that it will be ready for you whenever you want and that it will hold all of your cards securely. 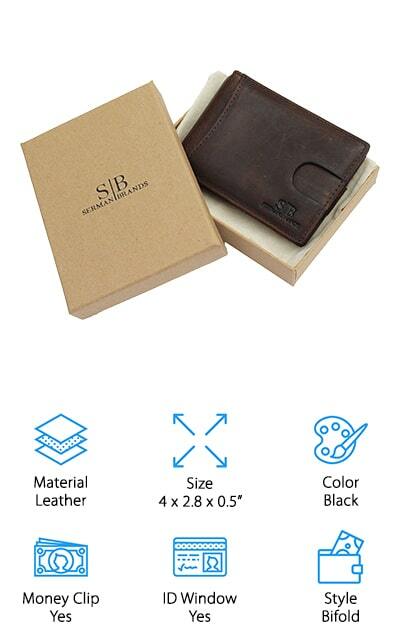 Made with genuine leather, this is possibly the best leather RFID wallet you’ll find. It’s a standard billfold that gives you plenty of space for everything that you want to carry with you. In fact, you’ll have an ID window for easy access to your driver’s license, as well as a pocket for money and several slots to hold each of your cards. Even better, the entire thing is RFID blocking, so you don’t have to worry about anyone stealing your information while they’re walking past you. 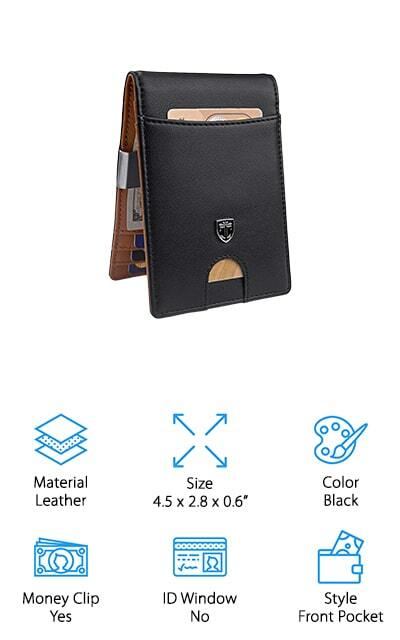 Available in several different colors, this wallet also comes in at a low price so you can get everything you need without spending a fortune. On top of all of that, you get a satisfaction guarantee so you can try it out for 30 days and see if it works for you. This sleek wallet is possibly the best RFID front pocket wallet. It offers a small design that’s easy to hold onto and holds only the necessities. Available in several different fun colors, it’s made of Italian leather for a soft but still high-quality feel. You’ll be able to hold up to 10 cards through 3 different pockets, with 5 being held in the RFID protected area. There’s even a strap inside that lets you pull cards out of the wallet more easily, so you’re not fumbling when it comes time to make a purchase or show an ID. Great as a gift, you’ll get a beautiful box included with the wallet so you can easily give it away, though you may want to keep it all for yourself. This wallet gives you protection for your credit cards and a whole lot more. 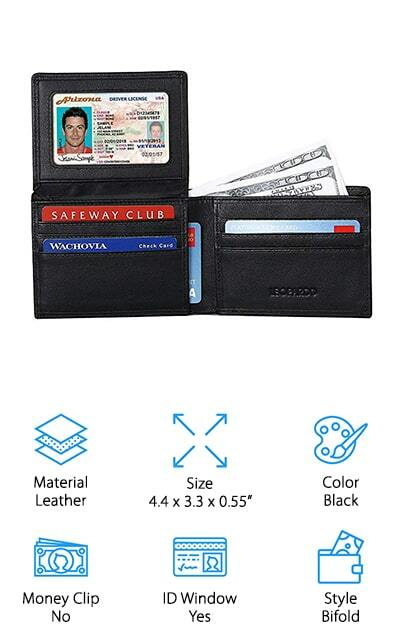 This wallet is actually a full-size option that offers you not quite the best RFID passport wallet, but a great option just the same. 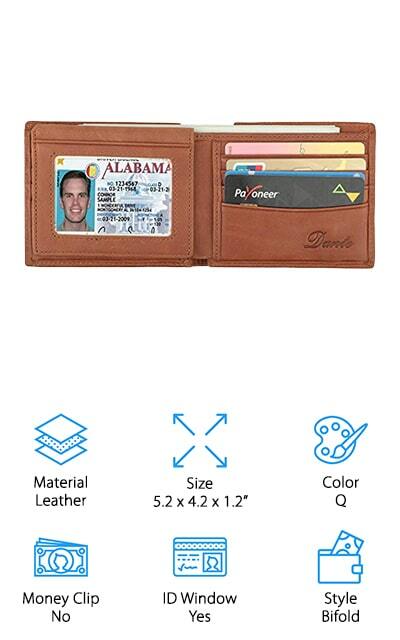 It’s made with genuine leather and actually gives you 2 separate ID windows, so you can have more than just a driver’s license ready to go. Available in several different colors for your own personal preference it’s also environmentally friendly, made with all-natural ingredients and no chemicals. That means you can feel even better about using it. You’ll get 8 card slots and space for all of your money and ID cards as well. Plus, you’re getting the RFID blocking that you’re looking for. The slim design means it’s easy to carry with you wherever you go, but you’ll still have everything you need. This may be the best RFID wallet you’re going to find. It comes in several different colors for your own personal needs and it’s made with high-quality leather so you know you’re getting something high quality and durable. 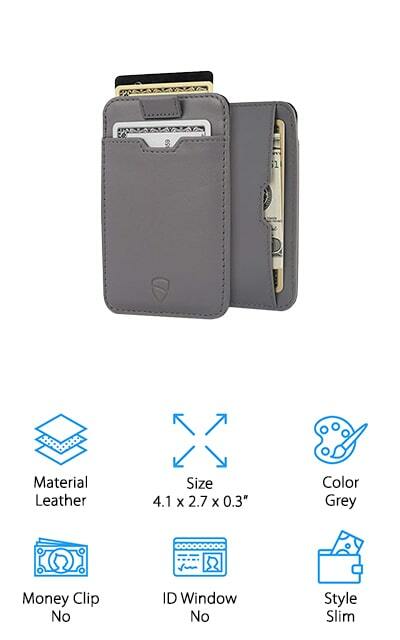 The slim style is convenient for most users, allowing you to easily put this wallet directly into your front pocket. It also holds up to 10 cards, so you’re always prepared for whatever you may need next. You’re also going to get a money back guarantee that tells you if you’re not happy for any reason you can return this wallet for a refund. You’re going to have great RFID blocking technology and you’ll be able to store your credit cards without concern for what’s going to happen. This slim wallet fits directly in your front pocket with no problem. Available in over 25 different colors, you’ll be able to showcase your own personal style with no problem. It gives you plenty of space for 4 different credit cards as well as slip-in pockets and a zipper pouch. You’re also going to have an ID window so you can easily show your driver’s license or other information whenever needed. With this wallet, you get to keep all of your information protected and private with the RFID blocking technology. The slim size makes it easy to carry with you all the time and the genuine leather that it’s made of makes sure you’re going to be comfortable with it. You’ll also be able to use it for a very long time to come because of the durable materials. This may be the best RFID blocking wallet, especially in this style. 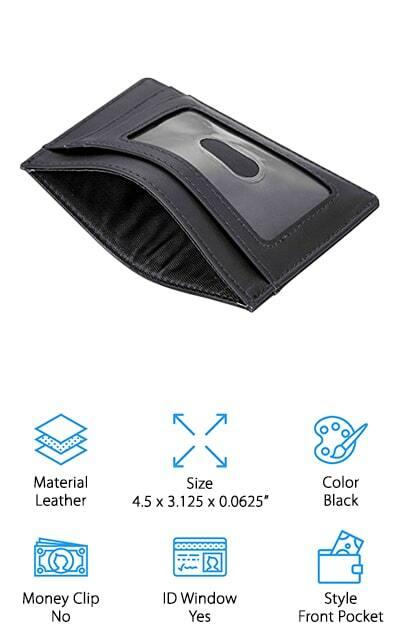 Designed to fit easily into your front pocket, this wallet actually folds over and provides you with plenty of space for your credit cards as well as a money clip to hold your cash conveniently ready for you. Available in several different colors, it’s made with the highest quality materials to provide you with the protection that you need. 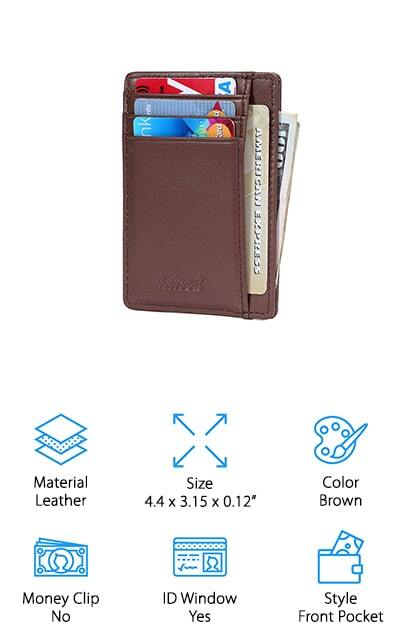 There are 7 different card pockets with 1 being an easy access for the card you use the most. The slim design is definitely going to be easy to carry and it’s going to provide you with a way to carry everything you need but not all the extras that you don’t. This is definitely a wallet you’ll want for yourself and even as a gift for others.